Announcement Colourful Jewelry + Apparel for Playful People -Let's have FUN! 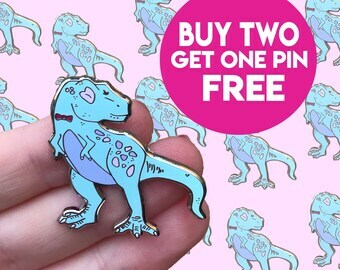 Rainbow ice cream tubs filled with all kinds of delicious flavours, Dinosaur wafer adorned cones covered in sprinkles, amazingly decadent Freakshakes and a T-rex Treat for the donut aficionado. And the best bit... You can wear them! You'll look all kinds of awesome strutting your stuff and snapping a selfie for insta! Head over to my instagram page to see some sneak peeks of the collection. Colourful Jewelry + Apparel for Playful People -Let's have FUN! Rainbow Milkshake Necklace Jewelry - Colourful Pastel Goth Kawaii Food + Drink Sweet Treat Laser Cut Acrylic Necklace Jewelry. Rainbow Milkshake Brooch Jewelry - Colourful Pastel Goth Kawaii Food + Drink Sweet Treat Laser Cut Acrylic Brooch Jewelry. 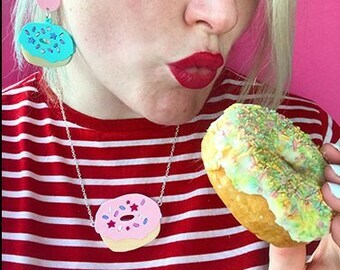 Rainbow Ice Cream Necklace, Ice Cream cone Jewellery, Laser Cut Acrylic Statement Necklace. 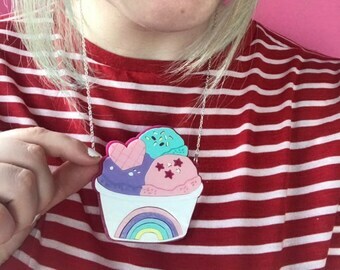 Rainbow Necklace, Ice Cream Jewellery, Pre- order Rainbow Ice cream tub, Laser Cut Acrylic Statement Necklace. T-Rex Necklace, Party hat T-REX Dinosaur Laser Cut Acrylic Necklace. 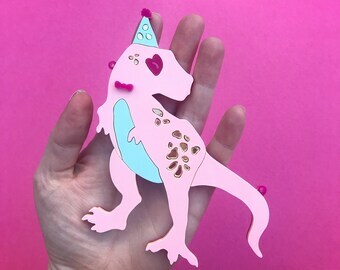 Diplodocus Brooch, Pastel Pink Cute Dinosaur Jewellery, Laser Cut Acrylic Statement Brooch. Rainbow Donut, Laser Cut Acrylic Pin Brooch. 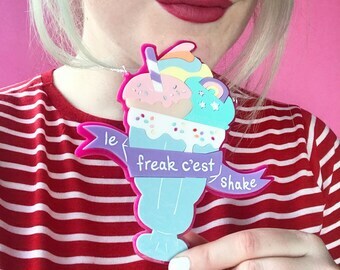 Milkshake Necklace, Colourful Freakshake, Laser Cut Acrylic Statement Necklace. Colourful Stegosaurus Dinosaur, Laser Cut Acrylic Statement Necklace. 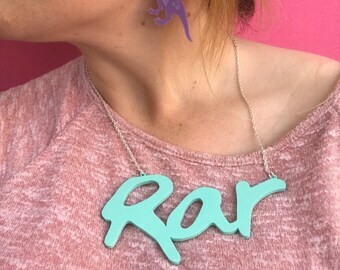 Colourful Rar Dinosaur Word, Laser Cut Acrylic Necklace. Donut, Laser Cut Acrylic Statement Earrings. Tricerarops wafer earrings, Laser Cut Acrylic Statement Earrings. 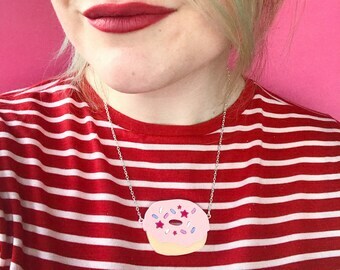 Colourful Pink Donut, Laser Cut Acrylic Statement Cuff Necklace. Mint Donut, Laser Cut Acrylic Statement Earrings. Rainbow Ice cream tub, Laser Cut Acrylic Statement Necklace. 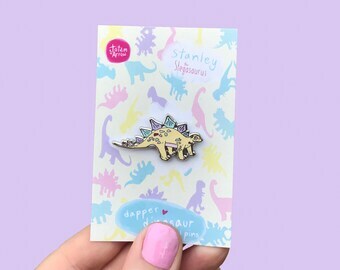 I love these pins !!! Totem & Arrow is the creative outlet of Kim from Aberdeen, Scotland. Now living in an old converted cotton mill in Bollington, Cheshire at the foot of the peak district. Always in search for trinkets, treasures and shiny things a fascination for jewellery was found in my grandmothers vintage jewellery box. A left handed sole proclaimed magpie, always found with pencil stains engraved on my hand in my little balcony studio in 'The Mill' creating vintage inspired jewellery, quirky and cute illustrations that sometimes end up as a little jewellery collection. I hope you enjoy the items in my shop as much as I enjoy making the little treasures. 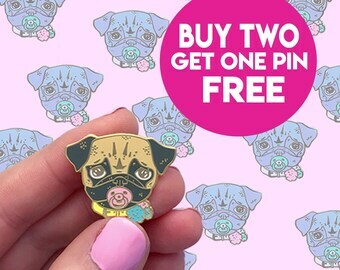 You will find doodles and musings on this page along side quirky and cute illustrations, wearable art and vintage inspired handcrafted jewellery. If there has been an error in the listing or if the item has been damaged in transit or through normal use, I will pay the return shipping costs and offer a full refund if notified of this within one month of purchase. If the buyer has changed their mind and wishes to return an item, I will accept returns within one month of purchase. In cases where the buyer has changed their minds, the buyer will pay the return shipping costs and I will offer a refund of the item price. If the item is lost in the post, I will post a replacement if possible, and if not I will refund the buyer the cost of shipping & item price. *Apologies but hair accessories and earrings can not be returned for hygiene reasons. Please pay within 3 days of purchasing an item. Please feel free to contact me with any questions, comments or concerns. I ship internationally, and offer optional insurance if the buyer should request it. Please convo me if you would like the package to be insured and/or sent with a confirmation & signature on delivery and I will send you an updated total. I will often use recycled packaging to ship items. All items are wrapped in gift bags and wrapped securely inside padded envelops or boxes. The buyer is responsible for all customs fees, should any occur. All items ship from the UK. If you live outside of Europe, your purchase will be shipped via Royal Mail Air Mail and will reach you in 10 days to 4 weeks (in rare cases). If you would like the item tracked within the UK and signed for, that service is 10 pounds. If you would like a specific service please just get in touch and I'll strive to accommodate your needs. Access - you may have the right to access and receive a copy of the personal information I hold about you by contacting me using the contact information below. Change, restrict, delete - you may also have rights to change, restrict my use of, or delete your personal information. Absent exceptional circumstances (like where I am required to store data for legal reasons) I will generally delete your personal information upon request. Object - you can object to (i) my processing of some of your information based on my legitimate interests and (ii) receiving marketing messages from me after providing your express consent to receive them. In such cases, I will delete your personal information unless I have compelling and legitimate grounds to continue using that information or if it is needed for legal reasons. Complain - if you reside in the EU and wish to raise a concern about my use of your information (and without prejudice to any other rights you may have), you have the right to do so with your local data protection authority.